Broadcast Engineering is the sort of job that will keep you very busy, and staying organised can be tough at the best of times. For several years now, I’ve been using Trello to organised all my day-to-day work. Here’s how I use Trello. For my day job, I have one main Board which helps me organise all all the work I do. It contains one card for every task/job I need to complete. Cards generally move left to right between each list, and sometimes jump to “On Hold” if there’s a major issue completing it. My “Pending” list basically becomes a place to note any requests from users as well as any work I identify myself. “Ideas” is where I make note of longer term projects we may want to look at, such as upgrading a studio or replacing a phone system. These ideas require lots of fleshing out (and usually money) before work can begin. In contrast to this, “Pending” items can usually be done with the resources we have on-hand (or can be obtained easily). You can make your own labels, but these are the ones I use. These may need to change based on the sort of work you do. For example, I do lots of Software Development work but almost no RF work – so RF doesn’t get a label on my board, while it may feature prominently on yours. Labels make it easy to track where my time is being spent and spot any pain-points. 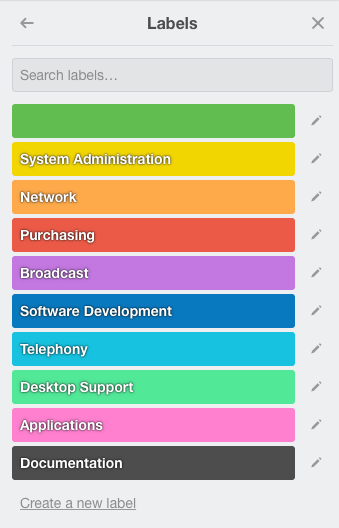 Within Trello, there are filters to view cards which have specific labels. This is handy if I want to focus on a particular area for a while (I might have a day where I just work on Dev items, or just do Documentation). I make comments to remind myself what I’m up to, or any steps I take to complete a task. For example, if I’m reconfiguring any equipment then I’ll put the configuration commands in as comments. If I’m changing IP addresses, I’ll note the old and new IPs. This helps me in the future if I need to come back and remember what I changed, or repeat the task again. Trello itself serves as a basic form of documentation. If I have any particular trouble with completing an job, I’ll also put that in the commands so I can come back to it later and pick off where I left off. If there’s any photos, I’ll attach those. If there’s other people who need to work on the job with me, I’ll add their profile to the card so they get notifications of changes. Once a job is done, I’ll move it to the top of the “Completed” list. After a while (usually at the end of each year), I’ll admire what I’ve done and then archive everything in the “Completed” list. Trello is a great tool, but it’s just that – a tool. It won’t work unless you actively use it on a regular basis. For me, Trello is always open in a browser tab. It’s also an app on my smart phone. 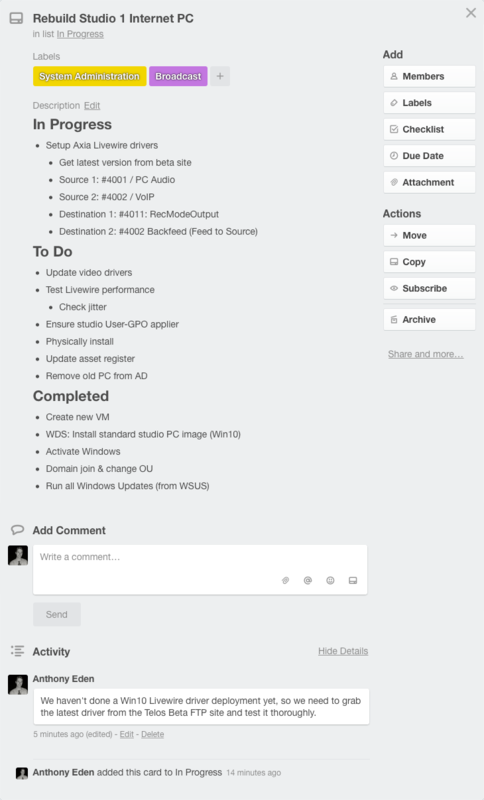 I’m in the habit of checking Trello to see what work needs doing, and updating it with my progress as I work. I also try and put all my actionable thoughts straight into Trello so I don’t forget, and don’t end up with scraps of paper all over my desk. At the start, you’ll need to be very deliberate about using it. I’ve been using Trello almost every workday since at least July 2013, and for me it now comes pretty naturally. 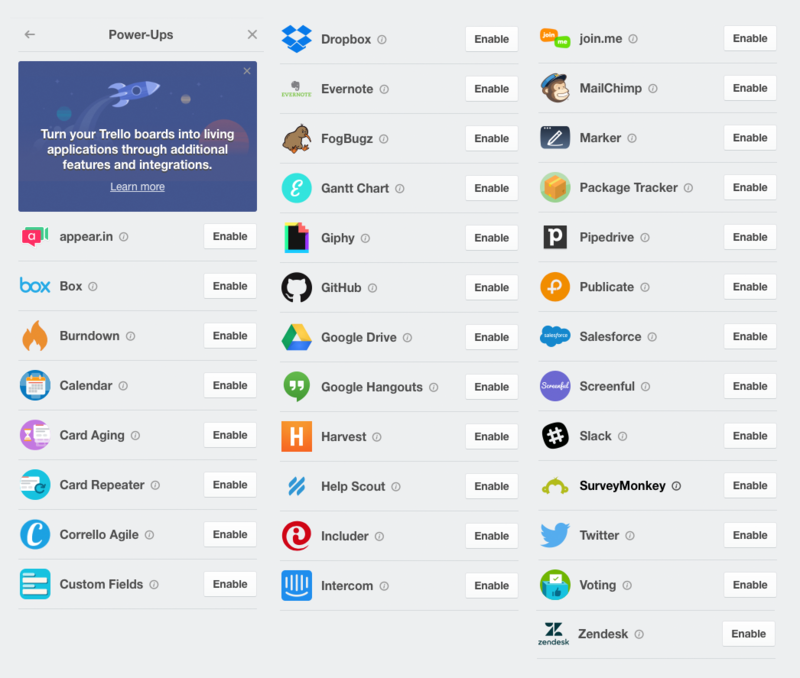 Trello contains a number of Add Ons (called “Power Ups”). These add additional functionality to your Trello Board, and allow you to integrate with third-party systems. For example, you may want to use the Custom Fields Power-Up to add extra metadata to your cards. This could include the time taken to complete a job, the budgeted amount, who approved the work, or the estimated difficulty (so you can send easier jobs to a trainee or volunteer). The Card Repeater Power-Up could be used to repeat tasks on a regular basis. Need to manually do some meter readings or change some batteries each week? Create a card and have it replicate itself at the required interval. If you’re developing software or using a source code repository to track config file changes, use the GitHub Power-Up to reference your commits or issues. Do you happen to use Zendesk for your end-user request ticket system? There’s a Zendesk Power-Up too! Track Due-Dates with the Calendar Power-Up. That’s pretty much it. Trello is a simple system to start using, but has endless possibilities. There’s even a REST API if you want to build your own integrations. If you have any tips for using Trello, or perhaps use different productivity tools, share them in the comments below!